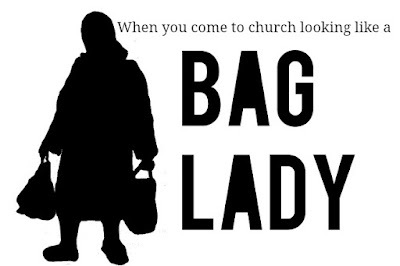 When you come to church looking like a bag lady should anyone care? My recent cashier at Dillard's most certainly would! My mom and I were shopping the clearance sale at Dillard's Department Store last week. The cashier chatted like we were old acquaintances. Somehow, our conversation turned to tradition. She raved on about her nieces and nephews doing things backward, nothing in the old traditional ways. She shared. We listened. She disgustedly disapproved of living together unwed, children out of wedlock and the audacity of her sister inviting her to a nephew's wedding with these important issues ignored! I’ll add here that I don’t consider these topics tradition. God doesn't approve this behavior because it is contrary to his word. I am following the conversation until she says, "And what about the way women come to church dressed like bag ladies? Didn’t their mother teach them how to dress?" Yep, she's a flaming traditionalist. Ms. Cashier didn’t know me from Adam or Eve's house cat. She had no way of knowing shoes are a huge obstacle for me. Dressing like a Philadelphia lawyer does not come easy for me. This is where I looked off, mind racing, feeling unworthy and disengaged from the conversation. Politely, I never commented on her question. I’ve owned the same black jumper for almost 30 years. I LOVE that old, faded, holed-pocket jumper. My safe, trusty knee-high boots are the perfect accessory! My mom HATES my jumper. She threatens to burn the dress. Her twin sister offered to buy me a replacement if I’d throw it away and never wear it again. My old black jumper is the most comfortable dress in my closet. I feel good about it and think it's stylish too! I've kidded them about being jealous and envying how good I look in that tattered old plain jumper. Of course, my mom probably thinks I need a mirror! I understand mom and others and the traditions they've been taught like; Easter requires a new dress. What people don’t understand about my black jumper is I’ve worshiped Jesus corporately in that dress more than any other article of clothing I own. Jesus has wiped away my tears that spilled down my cheeks, curved under my chin, and rolled down my neck to land softly on the cotton fabric turning it an unfaded black. I gratefully wore the jumper with both of my pregnancies. I am so thankful I can wear this dress with my knee high boots hiding non-traditional feet, looking somewhat stylish and feeling somewhat normal. I can walk into the church with this ugly dress on, unassisted, because of what Jesus did for me. When I walk into the church looking like a bag lady, I’m not thinking about my clothing. I'm thinking about worshipping a King, my Savior! Leviticus 19:15 Ye shall do no unrighteousness in judgment: thou shalt not respect the person of the poor, nor honor the person of the mighty: but in righteousness shalt thou judge thy neighbor. My Mother taught me how to dress, but, who am I pleasing? The fashion police or Jesus? 2 Timothy 2:4 No man that warreth entangleth himself with the affairs of this life; that he may please him who hath chosen him to be a soldier. If I'm more concerned about my clothing than pleasing my leader, I am tangled up in this life. I'd rather please God with him accepting my praise offering than make others happy with my clothes. I'm a soldier of the cross every day, clothed in His righteousness!